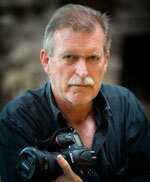 The Duke and I first met 30 years ago, when he approached me about publishing a book about Game Cards from all the great shooting estates.I was then Managing Director, and a part owner, of Debrett’s Peerage and Baronetage, and, since acquiring it in 1976 I had gained a reputation for publishing rather esoteric books about shooting, as this is a passion of mine. 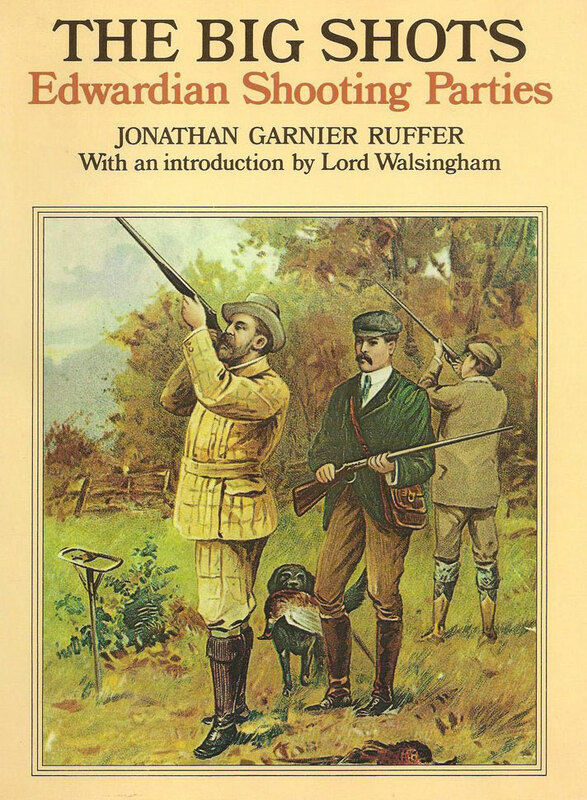 One of the first books I published under the Debrett imprint in 1977 was, ‘The Big Shots – Edwardian Shooting Parties’ by Jonathan Ruffer, which became a bestseller in the shooting world, and is still in print 38 years later! So, I was immediately interested in the idea of a book of ‘Game Cards’ because they are a wonderful record of the shooting world of that time, and, like ‘The Big Shots’, documented some of the excesses of the Edwardian era, and they also provide an invaluable social record of who shot where, when, how well, and with whom! Anyway, this is how I met the current Duke, who was then Lord Ralph Percy, and was working as a Sporting Agent and living in Sussex. Having commissioned the Book of Game Cards, we had a lot of fun putting it all together, including organising clay pigeon shoots at Albury, the Percy’s estate in Surrey, and I would invite Ralph to join various ‘Debrett’ teams competing in Charity clay shoots including one at the Holland & Holland shooting grounds, where we won the team event, shooting with the Earl of Onslow and Ian McCorquodale, and the highest individual shot went to Ralph! 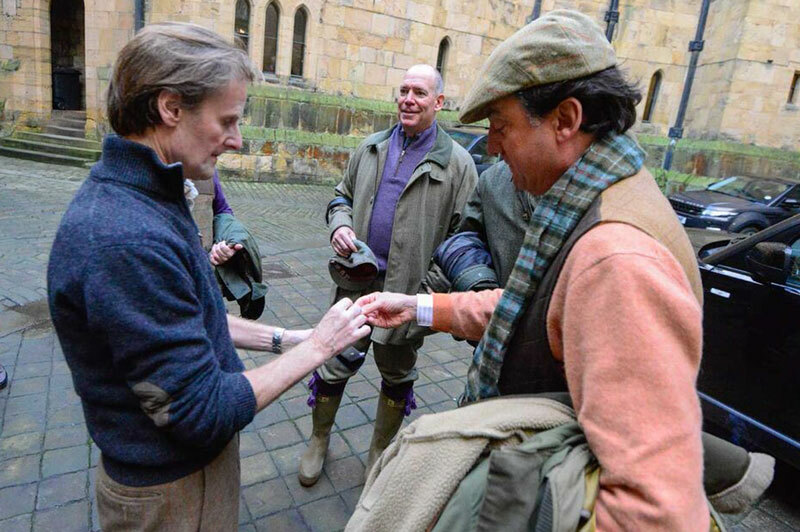 He also invited me to be a ‘guinea pig’ for his experiment to arrange a ‘Macnab’ for his clients, and if you are interested you can read all about it by clicking here and reading my article, The Elusive Macnab – Beginners Luck. Anyway, Debrett’s Book of Game Cards was ‘launched’ with great ceremony at Syon House in the summer of 1986, and soon afterwards, my former wife and I received an invitation to go and shoot for two days at Alnwick, and I looked forward to this with great anticipation. We had two of the best days’ shooting I can remember, amidst the stunning scenery of Hulne Park, and the impressive backdrop of the Castle; it was all quite magical, and made even more fun by shooting with the Percy family and their guests. I remember two particular incidents very well. 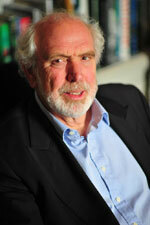 The first was when I found myself in what is known amongst the shooting fraternity as a ‘Percy Sandwich’ . This is when you find yourself drawn on a peg between Ralph and James Percy, who, as two of the best game shots in Britain frequently take their own birds, and then ‘mop-up’ any birds which you have missed! This particular ‘Percy Sandwich’, was enhanced by the participation of a third layer, in the form of their father, the Duke, who, despite his preference for hunting to shooting, had no difficulty in bringing down seemingly impossibly high birds with a 28 bore about forty feet below us. At the end of this particular drive, I walked up to Ralph, and apologised for my poor performance, only to be told ‘not to worry, I had made his father’s day’! 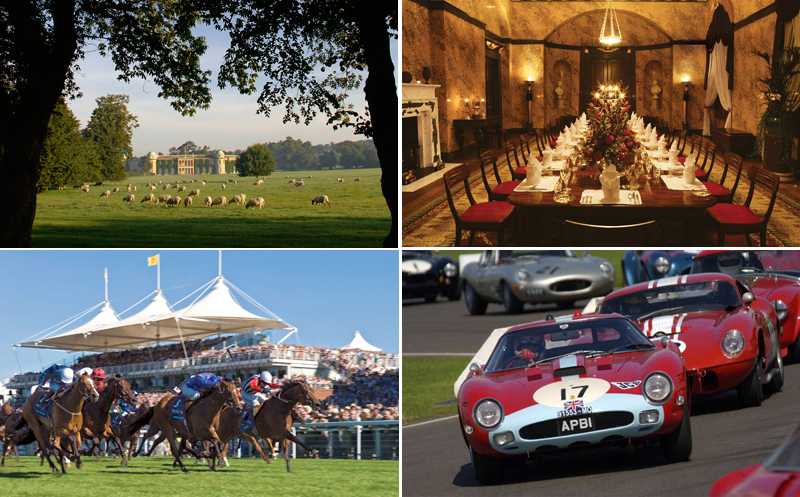 From memory, the old Duke’s guest was John Sheffield, who was a Director of Portals the security bank note company based in Hampshire where he lived on the fabulous Laverstoke Park Estate, which the company owned! 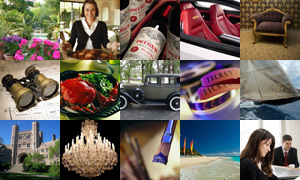 Sadly, Portals was acquired by De La Rue, the security printers, and they sold Laverstoke Park to Jody Scheckter, the F1 Racing Driver, who has turned it into a highly successful organic farming enterprise. The rest of the party included Harry, Ralph’s elder brother, who had invited Henry Wyndham of Sotheby’s fame, Ralph who had invited me as his ‘publisher’, his younger brother James and the Count de Cabarrus, who had married Ralph’s sister, Caroline. So it really was a family shoot, and lived up to all expectations. However, the old Duke had some trouble remembering my name, although he clearly thought that, with my beard, I bore a passing resemblance to the then Special Envoy to the Archbishop of Canterbury, Terry Waite, who was still being held captive by his terrorist kidnappers in Beirut at that time, because towards the end of lunch in Hulne Priory, the old Duke called down the table, ’Could somebody ask Terry Waite to pass the Port!’ I had obviosly been a little slow in keeping the port on the move! Enough of reminiscing, shortly after our meeting on the Test last year, I received an email from the current Duke, suggesting that I contact a friend of his, who rejoices in the wonderful name of Count Alessandro Guerrini-Maraldi, who, it transpires, takes two days shooting at Alnwick every year, and wanted to record these shoots for posterity. We arranged to meet for lunch at an Italian restaurant in the City, just a few minutes walk from the building where he is based in London. Alessandro is an Insurance Specialist, and spends much of his time abroad; visiting existing clients and introducing new ones, through his extraordinary International network of contacts at the highest level, and many of his clients have become good friends. Anyway, by the end of our excellent lunch we had shaken hands, and agreed to produce a large format book of 100 pages with 250 illustrations in a full leather-bound ‘Limited Edition’ with each copy being individually gold-blocked with the name of the recipient. In other words, the ‘Rolls-Royce’ of shoot books for this very special occasion. 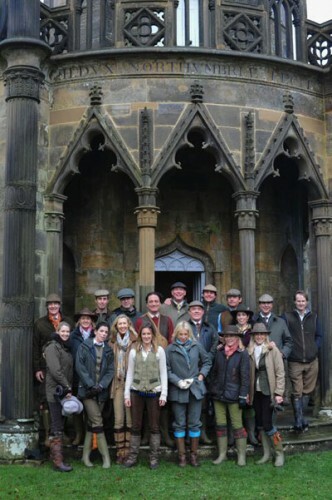 So it transpired that our first commission was for a two-day shoot at Alnwick Castle, hosted by His Grace, for a team of guns who were guests of Count Alessandro Guerrini-Maraldi. This was the best start we could have wished for to launch The Book of the Shoot. I think it is what can be described as ‘hitting the ground running’! 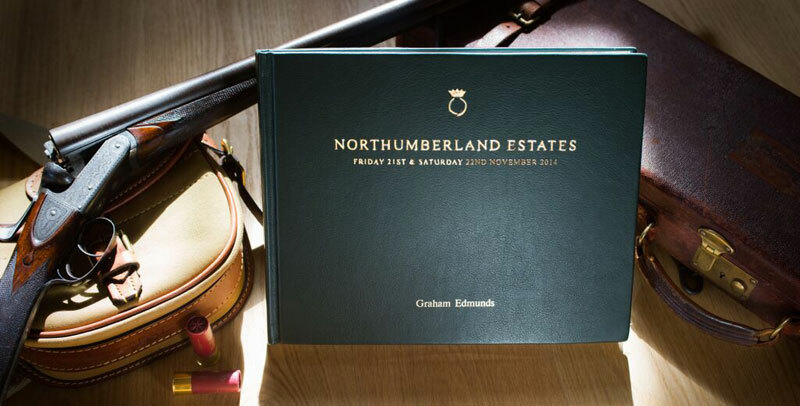 Contrary to popular belief, there are still some things which money alone cannot achieve, or acquire, and one of these is an invitation to shoot as guests of the Duke and Duchess of Northumberland and to stay in Alnwick Castle.This, for me, represents one of the most extraordinary experiences which any keen shot could wish for. 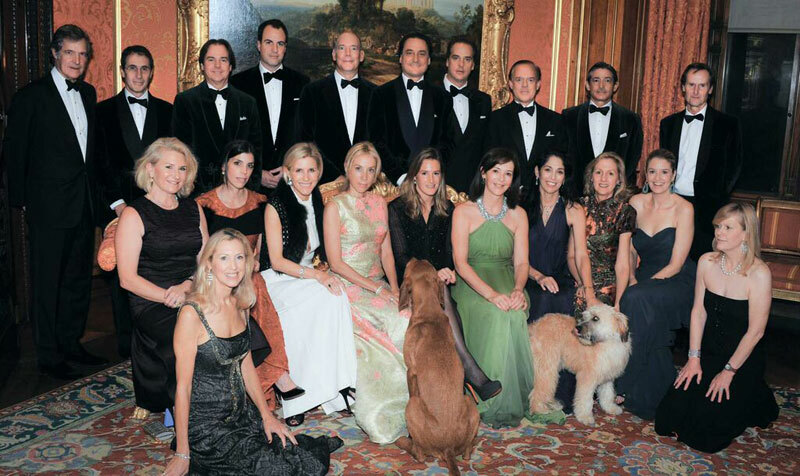 There is an exclusive group of people to whom this invitation is extended each year and Alessandro is one of these. 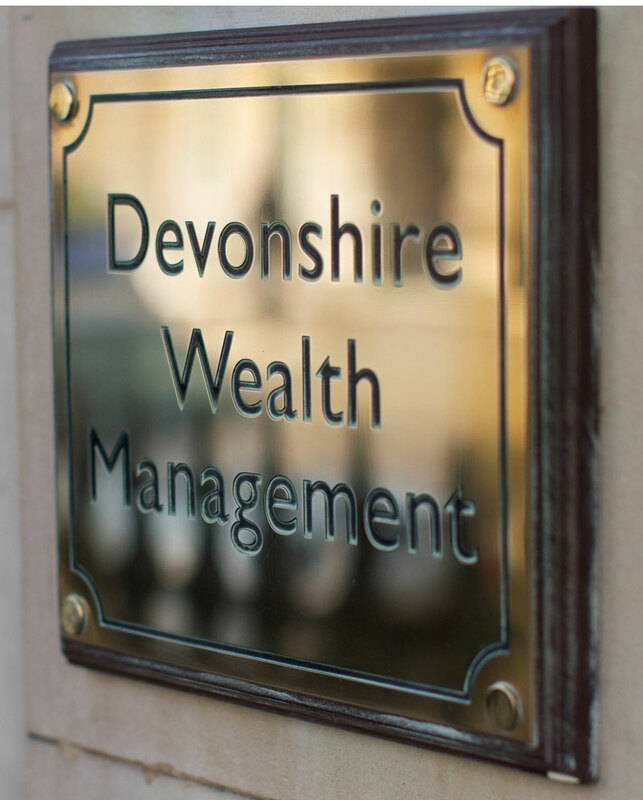 Alessandro had arranged two days shooting, back to back, with a formal dinner in between, to entertain his friends and business colleagues who included investment bankers, partners in Private Equity firms, and managers of property, and family Investment trusts, etc. They were a very interesting team of guns, and most of them were accompanied by their wives. They all proved to be a very friendly group, and we worked very hard not to let the photography get in the way of the shooting. 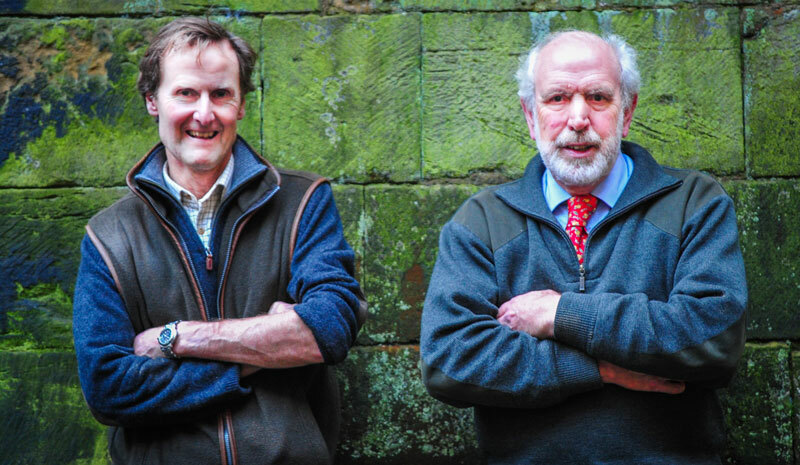 So special was this first commission that my friend and photographer, Graham Edmunds, and I went up to Alnwick two days early to carry out a reconnaissance of Hulne Park, where the shoot was to take place and of the Castle, the setting for the formal dinner. 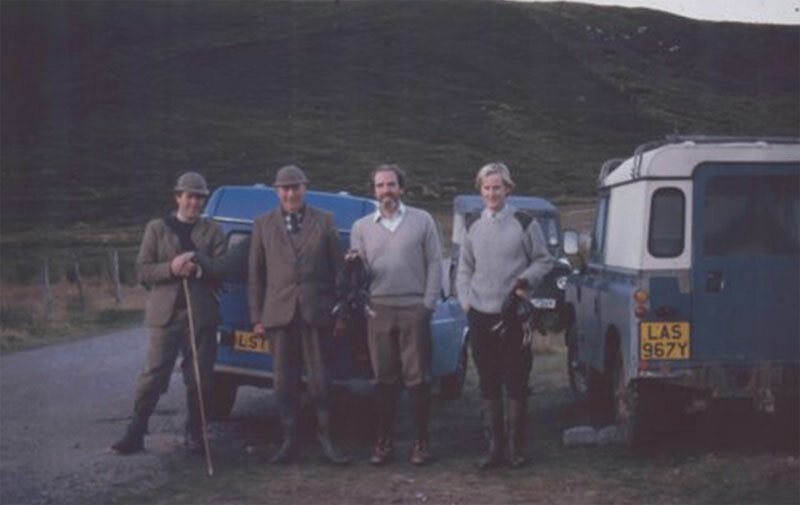 We arrived at Alnwick on the Wednesday evening, and the next morning, we had arranged to meet the Duke at the Estate Office in the Castle as he had very kindly offered to show us around Hulne Park. As we arrived he drove into the Outer Courtyard, and told us to hop in to his car, and we headed for Hulne Park which is a walled Park covering several thousand acres. Originally a hunting park, it now contains woods, moors, stretches of open grassland, and Alnwick’s Home Farm, as well as Hulne Priory, a monastery founded in the 13th century which is where the shooting parties have lunch.It was also the filming location for Marian’s home in the film, Robin Hood; Prince of Thieves, and Alnwick Castle was one of the locations used in the Harry Potter films, and consequently attracts Harry Potter fans from all over the world, who want to see the ‘real Hogwarts’! 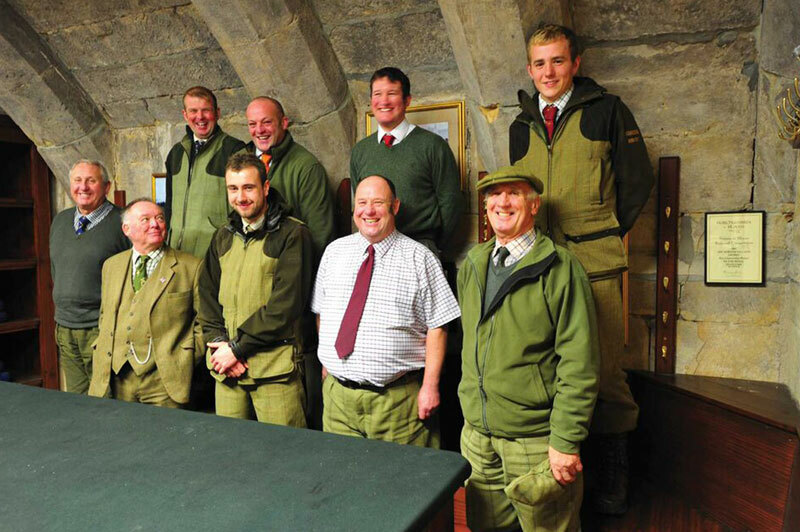 Hulne Park is a veritable sportsman’s playground, where you can fish, stalk, and shoot Grouse, French and English Partridge, and fantastically high pheasants, all within a few miles of the Castle. Since inheriting the title, the Duke and Duchess have greatly improved the castle and the photographs below show the Entrance Hll, Drawing Room and Dining Room. The Duchess, who is the Lord Lieutenant of Northumberland, has still found time to create the wonderful new Garden at Alnwick. This now attracts over 450,000 visitors a year, making it one of the top visitor attractions in the UK, and bringing £50 million plus into the local economy; no wonder the locals look so happy! 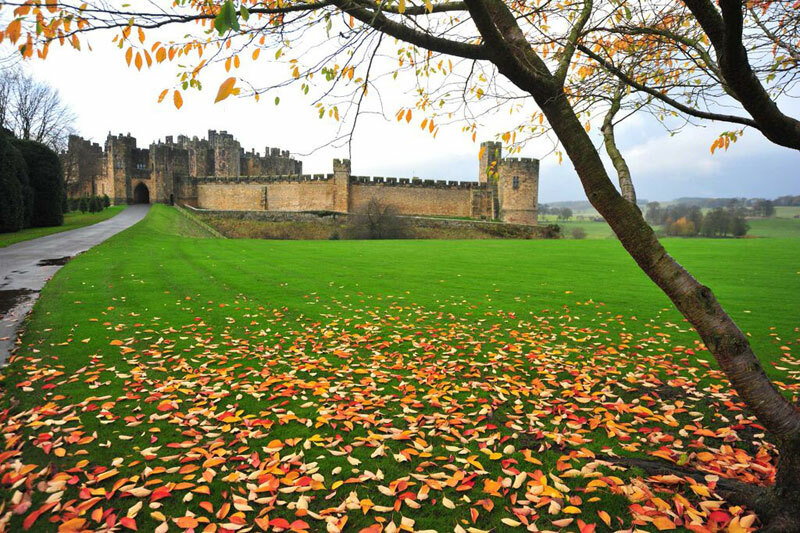 This has made Alnwick into something of a ‘boom town’, and there is great optimism and a palpable feeling of well-being, almost euphoria amongst the populace, and they share a pride in their town, the new gardens, and the Castle. Our preparatory visit proved invaluable in the two days which followed, and we retired to our hotel to review the day’s activity, and plan our coverage of the shoots. 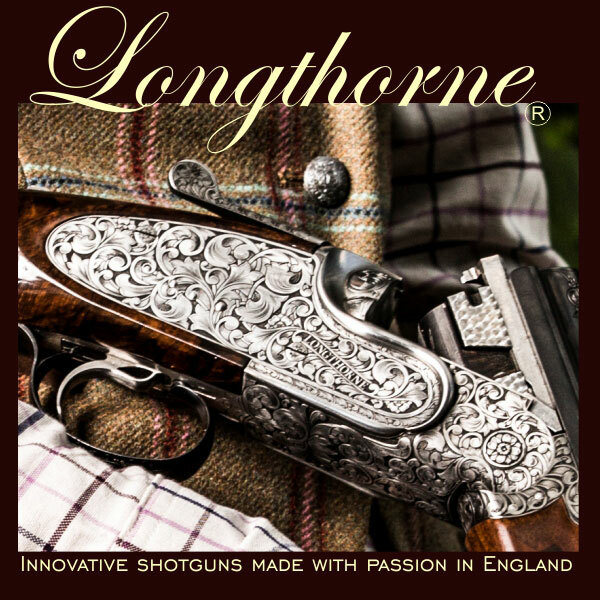 We were up bright and early for the first days shooting, and drove to the Castle for an early start, and found the loaders getting everything together for the guests, which involves taking up to 500 cartridges, plus their guns, mostly pairs. The guns started emerging from the Castle into the medieval Courtyard, and at 9am the Duke emerged to offer pegs to the waiting guns, and a few minutes later we were in a convoy heading off to Hulne Park, and the first drive, Middle Bunkers, which offered a stunning array of seemingly impossible birds, many of which were technically out of range, but a few were brought down much to their delight and surprise of the guns. We then stopped for Elevenses, gathered around large wrought iron ‘braziers’ to help keep out the cold. After the next drive which was just as challenging as the first, we drove to Hulne Priory in the middle of Hulne Park, for lunch. Hulne Priory stands on the site of an older Monastery founded in the 13th Century by the Carmelites, or ‘White Friars’ which was one of the orders of the Mendicants bound by their rule to live in extreme poverty; not a policy adopted by the guns on this shoot! Substantial ruins of Hulne Priory survive, watched over by stone figures of Friars carved in the 18th Century. It was therefore somewhat ironic that here was a group of friends 15 years into the new Millennium enjoying a lunch and wines, which the Monks cannot possibly have imagined. We were greeted at Hulne Priory by the immaculately mannered Andrew Farquharson, who is the Comptroller of the Household at Alnwick, and personally organises the shoot lunches at the Priory, which has a small Drawing Room with a large fireplace, where drinks are served before lunch, but no electricity, so the lunches are cooked on a calor gas cooker, but this in no way detracts from the quality. 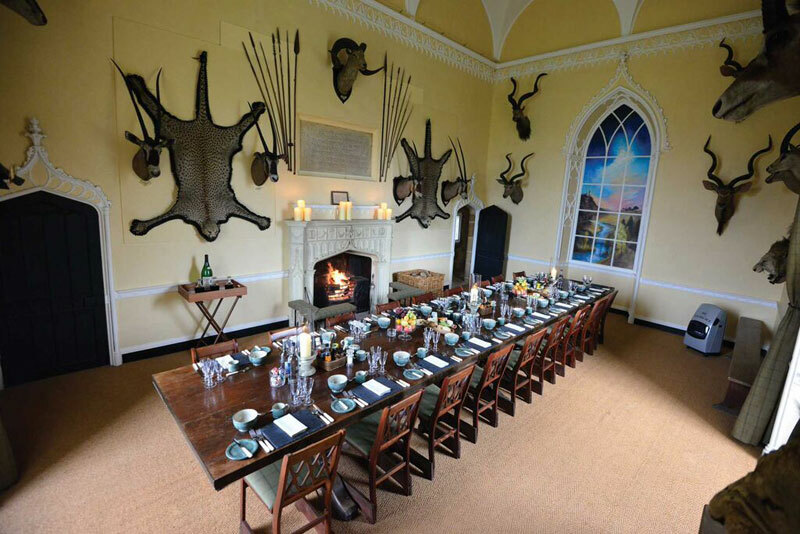 The entire Priory is lit by candles, which makes for a romantic atmosphere, and guests walk along a short corridor to the dining room which has been beautifully decorated with Big Game Trophies including a full tiger skin rug and numerous other sporting ‘Trophies’ collected by previous generations of Percys. After a wonderful lunch, washed down with some superlative wines, the guests had to be ‘dragged away’ from the charms of Hulne Priory, and back to the business of shooting, but we managed to get a group photo of the ladies before lunch, and another, of the whole party in the grounds of the Priory just after lunch. The only drive after lunch was North Bunkers, which provided an impressive challenge, and gave the guns much pleasure, and then it was back to the castle for tea and a rest before the feast which was to follow that evening. The host, Alessandro, had hired a celebrity Chef called Martin Wishart, who produced an innovative menu accompanied by equally impressive wines for the occasion. We photographed the guests having pre-dinner drinks in the magnificent Library, and then took a photograph of the whole party in the Drawing Room, before they moved to the fabulous Dining Room, where, after taking a few photographs, we left them to their own devices. We were back again the following morning for the second day’s’ shooting which included Cat Crag and Hollywell in the morning, and the Pumping House after lunch, and we arrived in time for the ‘drawing of the pegs’. It was raining quite heavily by the time we reached Cat Crag on the banks the River Aln, amongst some impressive woodland, made more notable by numerous ‘Wellingtonias’ which dwarfed the guns standing beside them. The first drive began in heavy rain, but by the time we arrived at Brizlee Tower for Elevenses, the sun was out, and we looked forward to a good day’s shooting. Brizlee Tower was built in 1871 by the first Duke as part of a set of memorials to his wife, Elizabeth, who had died in 1776. The Duke built a suitable memorial to her at each of her favourite places on the Estate, employing Robert Adam to create the design. Matthew Mills, a local Mason, who had worked on the restoration of the Castle with Robert Adam, built the tower. The influence of the first Duke is clearly visible today, and the process of planting suitable trees continues unabated. For the next drive, Hollywell, we left Hulne Park, and lined up on a tenant farmer’s land, only to witness yet another incredible drive, with the birds rising out of the game crop, and a large wood on top of a hill, and flying very high, and very fast over the guns, creating fabulous opportunities for those who could judge the speed of these stratospheric pheasants. After yet another perfectly orchestrated lunch at Hulne Priory, skilfully organised by Andrew Farquharson, the party moved on to the final drive called Pumping Station. Here the birds are driven off the hill on which Brizlee Tower stands, and the guns line out along the hill, and try to hit amazing birds which come over at an alarming rate. So, by the end of this last, very sporting drive, we were all ready for our tea back at the castle. At the end of the two days shooting, the general consensus amongst the guns was that shooting at Alnwick, was about as good as it gets, and I concur. And all the loaders and beaters who provided such good sport, and my wife and Assistant Editor, Chrissy, for being such a good sport! I would also like to thank Lindsay Dipple, who manages the Press Fleet at Jaguar/Landrover, for allowing us to road test the new Range Rover Sport during our six days at Alnwick, and you can see our review of this superb machine by clicking here. 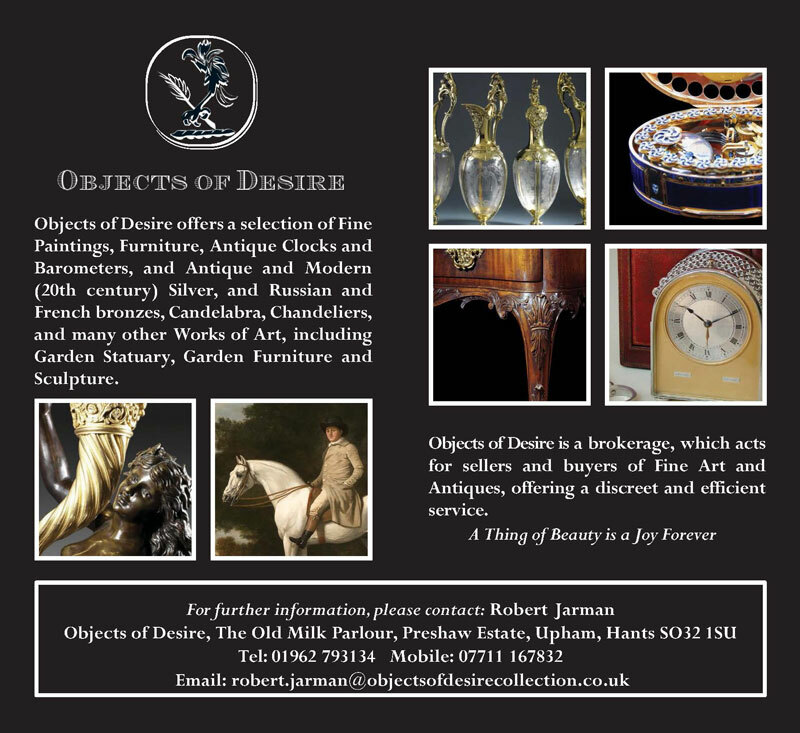 The Duke and Robert Jaman – The Way They Are Now!